U Series LS tractors, now available from Mirco Brothers , are marked by their advanced technology and excellent efficiency. They are optimal for small farming or hobby farming. Powerful Engine - All modes within the tractor are powered by impressive Mitsubishi technology. The water-cooled 4 cylinder engine offers high performance with low fuel consumption and low vibration/noise. It meets EPA, ISO, OECD as well as EC certificates. Remote Valve - U Series LS tractors have an open centre system with 1 or 2 double acting remote hydraulic valve to suit customer’s needs. They also have a Monoblock design valve. Shuttle lever - There is a finger-trip control type shuttle lever for efficient forward/reverse shifting. New grill design - The new aero-dynamic bonnet designed by LS focuses on excellent visibility, while the new chrome front grill prevents rust. Flat deck - A true flat deck design and rubber mat is standard for safety. There are fewer holes in the floor for less noise, less dust and easy cleaning. Tilting power steering wheel - The adjustable power steering wheel optimises the tractor’s user-friendly working conditions. Transmission - These tractors have16F×16R basic transmission, while 32F×16R transmission with Creeper is optional. A Synchro Shuttle allows customer to operate the tractor more conveniently. Isolated luxury cabin - An isolated luxury cabin with air-conditioner is optional. Low noise and vibration meet the requirement of EC homologation. 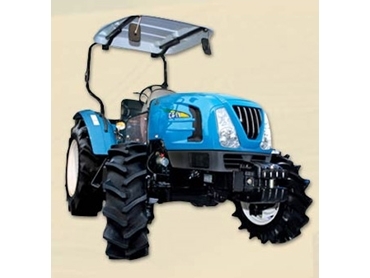 Performance oriented design - Operators can dedicate both hands to controlling the tractor conveniently and efficiently. One touch Open Bonnet - A customer oriented bonnet design allows convenient service access and reduces maintenance time and costs.